A wonderful compressor that adds to your sound, and in this master format it´s even more desirable. Silky sounds. Forgiving behaviour. Precision stereo master design. Mysteriously, the knobs are numbered not named. Internal tweaking is possible but rarely necessary. For some considerable time, the large-format analogue console was the object of desire for many music producers and engineers. But with much of this hardware now looking like dinosaurs, anyone after an analogue fix has focused their attention on quality outboard. In fact, if choice is anything to go by, the analogue outboard world is experiencing a bit of a renaissance. Traditionally the domain of small boutique manufacturers, with a few exceptions the market is dominated by British and US companies. One such company is Thermionic Culture (the brainchild of Vic Keary, designer of the famed Chiswick Reach compressor). Over the last few years TC have released a handful of top-flight units including the original Phoenix valve compressor and the Pullet passive EQ. This Phoenix compressor is the updated 'master' version. If the name isn't enough of a giveaway, a quick look at Thermionic's website will tell you just how purist their approach is. Founded on the belief that discrete, non-IC and preferably valve-based circuits sound the best, it's no surprise that the inside of The Phoenix looks like it could have been built any time in the past 50 years. With six valves, famous Sowter transformers (both for audio and mains) and plenty of point-to-point wiring, it's clear that many man hours were involved. It certainly puts the £3,231 price tag into perspective. 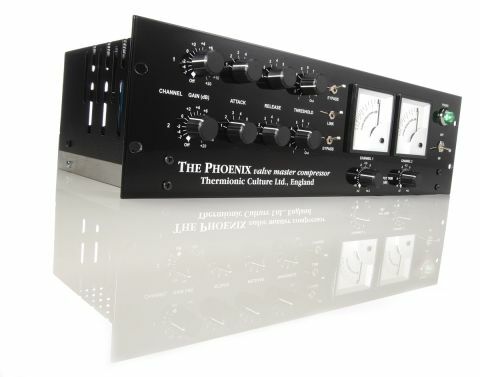 The Phoenix's design is a 'Variable Mu' compressor. This is a term commonly associated with the Fairchild 670 compressor, although Manley Labs actually own the trademark name Variable Mu. The design relies on the behaviour of a certain type of valve to control gain. The result is a compression characteristic whereby the ratio changes with the amount of compression being applied. You'll notice there's no ratio control on the front panel. Also, rather cryptically, most controls are simply numbered rather than linked to particular values. This goes hand-in-hand with the general inter-relatedness associated with this design. In keeping with the 'master' tag on this version, all knobs are notched allowing easy recall and setting up for stereo and there's a stereo link switch. A number of internal potentiometers can be tweaked manually through the top grille, although in day-to-day use, only those that affect the electronic meter zeroing should be touched (they've included a screwdriver for the purpose). The meters can also be adjusted mechanically from the front panel. If this sounds unnecessarily complicated, it isn't. Each unit gets a full line-up prior to shipping, and the most you can expect is a minor adjustment to the meters. As the valves age (or if they need to be changed), proper adjustments may need to be made, hence the internal pots. Anyway, the review unit required no tweaking. There's an element of mystery about this sort of box. Firstly you have to get over the labelling: the lower the number, the faster the attack and release. Threshold, on the other hand, is completely out at the highest value, with 'one' representing its lowest value. Also, some of the knobs are fully switched (attack and release) and others are continuous but with indents. In context it makes sense, as does the bypass, which links inputs to outputs, avoiding both input and output gain stages. In use this is great news, as you'll find that getting the sound you want often requires combining both input gain and threshold adjustments, followed by a tweak of the output level. In essence, although this is the fun of a Variable Mu design, everything essentially affects everything else. Enter into this world, and the concept of accurate labelling becomes meaningless. So what does it sound like? In sonic terms, pretty amazing. Like a lot of great analogue gear, even just plugging it up adds something to the sound. But it's when you start pushing it that its sonic signature becomes really apparent. In compression terms this can be anything from a tightening or 'gluing' of the sound to real pump-action. But although it's capable of some sonic destruction, The Phoenix is also incredibly forgiving, making it very easy to get to grips with. In fact, you're far more likely to do all sorts of damage to your track with a cheap VCA unit or plug-in than with this baby. And that's why it makes a great addition at the mastering stage. Even so, using just one side for acoustic guitar is fantastic, as are the results you get with bass. But the most impressive results are with drums. Whether it's overheads, a sub group or just the whole kit, the Phoenix imparts bottom-end solidity to the sound combined with an impressive sheen to the high frequencies. The result soon becomes addictive. Valve compressors are widespread these days and you can pay anything from £100 upwards. But cheaper units tend to be hybrid designs and not Variable Mu, and this inevitably leads to confusion as to what a true VM valve compressor actually sounds like. The Phoenix is as far away from that as you can get and, in this 'mastering' format, a brilliant piece of gear. Yes it's expensive, but for good reason. And in this sector of the market, there are only a handful of designers making this sort of gear.